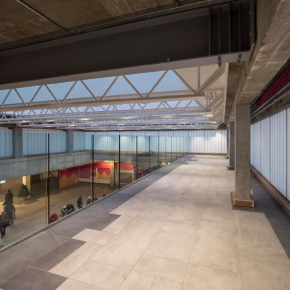 Magazine London has been unveiled as a new event space located on the developing Greenwich Peninsula, with Losberger De Boer excited to have been commissioned to deliver groundworks, structure and internal fit-out for this multi-million-pound project. Sitting next to The O2 and stone’s throw from Canary Wharf and London Docklands, Magazine London will offer a blank canvas for a wide variety of events and exhibitions. 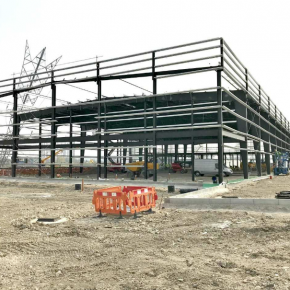 Building work for the event space has already begun, with a robust and practical steel-framed structure being erected on the west side of the Peninsula to provide flexible event space across two principal rooms and two mezzanine floors. The main structure is 36m x 93m with an 8.5m clear internal heights, linked to a large 18m x 25m reception area, allowing the venue to accommodate up to 3,000 guests. Larger events can also be accommodated by utilising the external areas for fun-fair rides, festival-type stages and other additional temporary facilities. The bespoke build merges an all black look and style with polished concrete floors to create a high-quality look, evoking an urban and industrial aesthetic. The semi-permanent structure will be in use for 8 – 10 years and work will be completed by July this year, ready for the public opening in September. Losberger De Boer has been working closely with developer Knight Dragon, as well as Venue Lab – a Vibration Group company and creators of the award-winning venues Printworks London and Landing Forty Two, to create this exciting new venue. 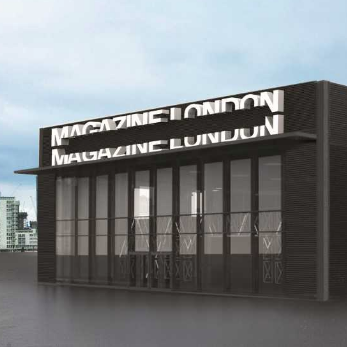 Magazine London was introduced as part of Knight Dragon’s ‘meantime development’ of the area, allowing them to create a cultural hub on the emerging Peninsula, generating both employment and a vibrant entertainment venue on land that would have otherwise remained unused. This is intended to add energy to the wider development of the area and is an integral part of their 25 year master plan. Throughout the process, Losberger De Boer has engaged with the Environment Agency and other key stakeholders to guarantee construction can be carried out with no risk to the nearby riverbank and no detrimental effect to those using the river bank walkway on a daily basis. Robert Alvarez, Commercial Sales Director, commented: “We’re thrilled to be working with an exciting and dynamic client like Knight Dragon on the Magazine London project. 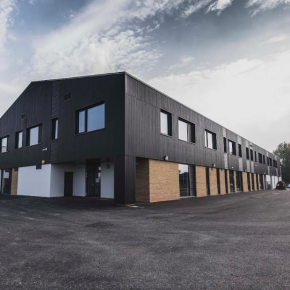 “Our teams have worked closely together, taken their inspiration and bespoke requests and now have the task of turning it into reality… foundations, steel framed structure, cladding and internal fit-out! “It’s going to be an intense few months, but we’re excited to see the build finally under way and planning for handover in July. 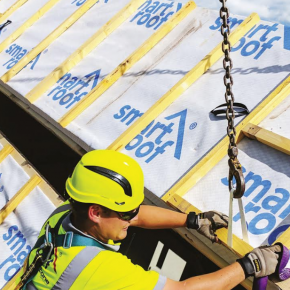 Paul Symons, of Knight Dragon, added: “Magazine London and the team at Vibration Group needed a building solutions supplier who could deliver their vision in good time and to a high specification.